Actual facts, not advertisements, tell the tale in 2016 – all wireless networks do NOT offer customers the same experience. Verizon’s $5 billion network investment during the first six months of this year helps give customers an even better network experience when they need it, and in more places. That sustained investment means fast data speeds, more people across America experiencing 4GLTE technology, and reliability that can’t be matched by mere advertising campaigns. Verizon invested another $5 billion in enhancing its network during the first half of the year. A track record of sustained network investment makes a difference when it counts, in times of disasters and every day. Verizon has now invested about $116 billion in our network since 2000, more than any other wireless company. Verizon has 2.34 million square miles of LTE network coverage. AT&T has nearly 600,000 square miles less LTE coverage than Verizon, T-Mobile has nearly 1 million square miles less than Verizon, and Sprint has nearly 1.5 million square miles less than Verizon. Third-parties who analyze network performance most often rate the Verizon network as fastest. In the latest RootMetrics national performance study, Verizon had consistently faster speeds than any other wireless network in 37 of 50 states, and tied in four others. A one percent gap in reliability equals nearly 10,000 more failed connections per minute versus Verizon’s network. That’s 5 billion more failures a year, any of which could be important if they occur during a critical time. Verizon’s 4G LTE network is engineered to provide, on average, 5 Mbps to 12 Mbps while downloading and 2 Mbps to 5 Mbps while uploading. At those levels, our customers have an excellent experience for all their data needs – video, music, email and social – and Verizon’s network provides those fast speeds consistently. 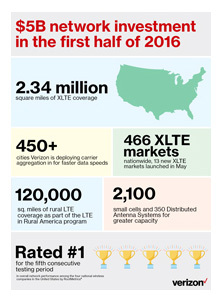 Our 2016 investment includes the expansion of Verizon’s XLTE network technology, which doubles our 4G LTE bandwidth and provides customers with greater peak Verizon Network Coverage, Reliablity Infographicspeeds covering nearly 2.4 million square miles in 466 markets nationwide, including 13 new markets launched in the last 90 days. 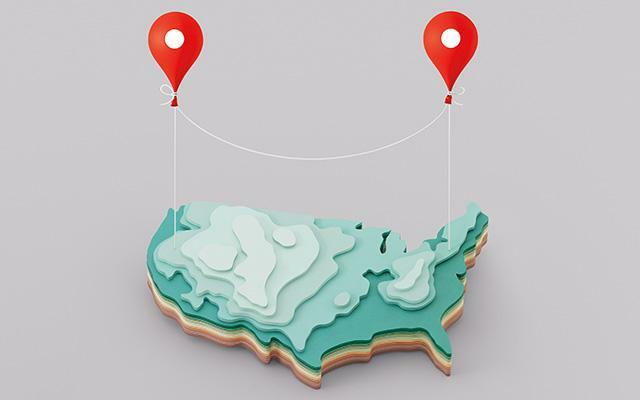 Verizon installed more than 1,500 new cell sites and added XLTE technology to more than 1,700 sites across the country from January to July, to accommodate exponential data usage growth and to enable customers to experience an unmatched level of reliable connectivity. Teams also focused on handling ever-increasing traffic on America’s largest and most reliable network by designing and deploying new small cell sites and Distributed Antenna Systems (DAS) in locations across the U.S., including arenas hosting the Republican and Democratic national conventions this month. Small cells consist of a radio, antenna, power and a fiber connection and are strategically positioned on street lights, sides of buildings or other structures. They operate within Verizon’s existing network coverage area to add additional 4G LTE capacity where it’s needed most – in heavily trafficked areas. Through mid-2016, Verizon deployed thousands of small cell solution nodes, including dozens installed throughout the San Francisco Bay Area in advance of Super Bowl 50. Distributed Antenna Systems (DAS) consist of unseen cables and numerous antennas distributed throughout high traffic areas such as stadiums, convention or shopping centers, office buildings, train stations, airline terminals, and dense, outdoor urban areas. So far this year, Verizon has deployed hundreds of DAS solutions. And because rural coverage also matters, Verizon’s LTE in Rural America (LRA) program includes 21 participants spanning 15 states and representing communities in 169 rural counties. The 21 LRA participants combined currently reach over 2.7 million people while covering approximately 120,000 square miles of America’s rural areas with 4G LTE, an area larger than the state of Arizona. Verizon engineers work around the clock, checking and testing the performance of our network, to ensure that it’s optimized across the nation. In a single day, they analyze over 1,000,000,000,000,000 (one quadrillion!) bytes of data. For the third time, Verizon’s network ranked highest across all six regions among U.S. wireless providers, according to J.D. Power 2016 Wireless Network Quality Performance Study℠, Volume 1. Verizon Wireless achieves the highest score in all three quality categories: calling, messaging, and data. Last year, Verizon invested $11 billion+ in wireless network improvements, and has now invested more than $116 billion in our wireless network since 2000.